Surrey is the gateway to the south-east of England and despite its proximity to London it has the reputation of being Britain's most wooded county. It is an area where traditional English villages mix with modern metropolitan centres of commerce and business. Surrey's reputation as London's 'stockbroker belt' is born out by is property prices, which are even higher than in the capital city. Surrey contains some of England's most beautiful countryside. The North Downs, which cross the centre of the county from east to west, provides spectacular views across river valleys, woods and forestry. Beyond these is another range of sandy hills, from which rises 'Leith Hill' the highest point in the county, finally giving way to the Surrey Weald. On a clear day the channel coast can be seen from the top of Leith Hill. In the north of the county the River Thames forms the border with Greater London, where it passes through Runnymede, the place where the Magna Carta was signed in 1215. Surrey Lamb Pie - traditionally made with mutton chops and topped with a thick layer of sliced mushrooms. Maids of Honour - small cakes that derive their name from the maids of honour of Queen Elizabeth I, who had a palace at Richmond. The original recipe is still a secret. First recorded in 722. 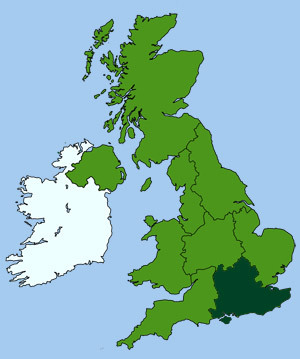 Its meaning is unclear but it most likely derives from the Old English 'Suthrige', meaning the kingdom south of the Thames.